Of all the Apple products I’ve purchased and used, I’ve only returned one. And, that’s the 1st Apple Watch Series. The 2nd ($399 direct from Apple) gen addressed the issues I had with it and has since replaced my GPS, and bike computers. I wear the watch pretty much all the time as a satellite to my phone and it’s sure liberating to not F with a Garmin before a ride; also, stay engaged during cocktails and dinner with friends. I’ll pay a premium for an Apple Watch without complaint, but not the redonkulous band prices Apple charges. I’ve tried various bands from Amazon and returned them all as too cheap in materials. Then, I started looking, researching reviews, and eventually found Juuk who sent me the Ligero ($138.99 42mm on Amazon; $128.99 38mm). Juuk isn’t the junk I found on Amazon because they’ve got experience in the Swiss supply chain, as their about page explains. As Juuk’s founder told me, they experimented with 10°, 12°, 14° and 16° drops in the connector links for the best fit on most wrist sizes, and settled with 10°. As anyone into design knows, god is in the details, and a slight drop angle means the connector links would jut straight out too far and expose the gaps in between the connectors and first links as the falloff becomes much steeper on the 2nd links on both sides. Juuk went to great lengths to make their drop perfect, even in ways most users probably wouldn’t notice. I didn’t until it was pointed out to me and what that means is, it’s a metal watch band you can wear comfortably all day. Juuk also developed a concave capsa pin system so that there would be less hunting around when adjusting the band. 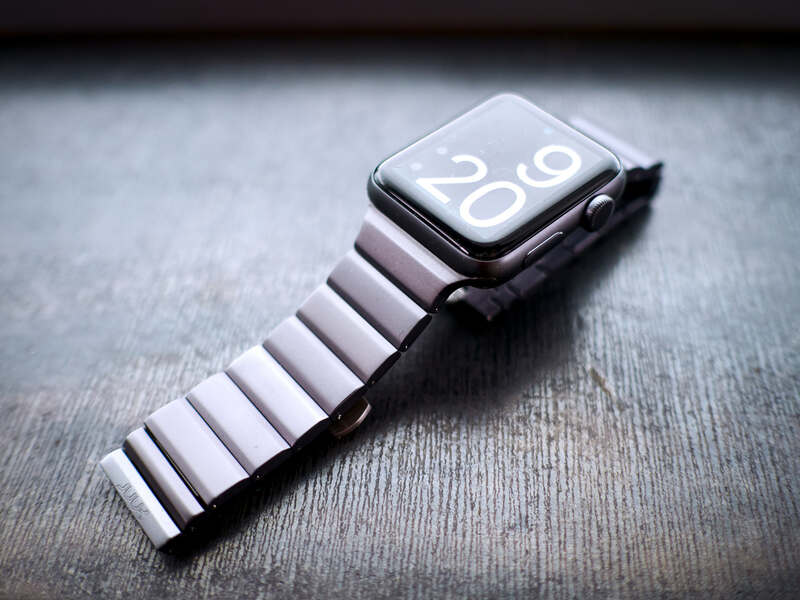 The anodized surface can scratch with a sharp pin, so this prevents unnecessary scratching on the link sides when adjusting it to your wrist. Flat pins are more difficult to locate the link’s recess and hunting for them can mean unsightly scratches. Juuk’s proprietary, 4-stage adjustment tool is super simple to use, and is included with every unit. This video demonstrates the adjustment process. So for rides, I’m wearing the silicon band that ships with the Apple Watch and when out or entertaining, my fancy band is the Juuk. 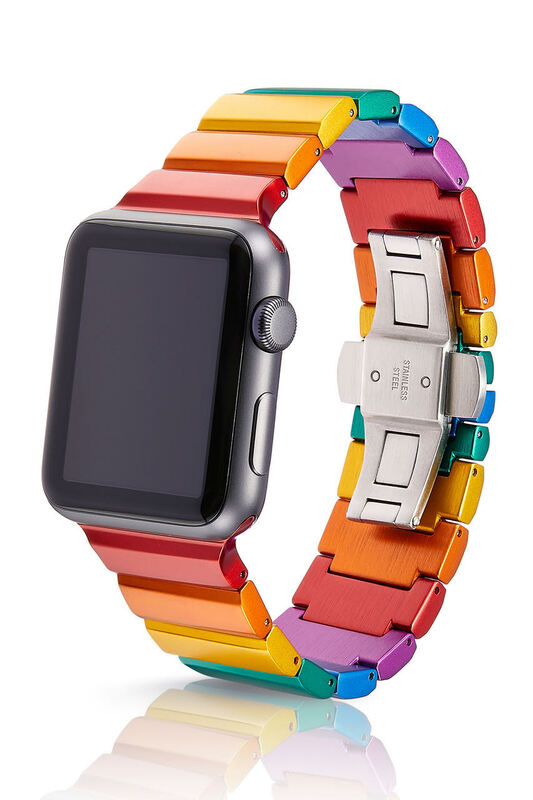 Apple’s 42mm Link bracelet is $549.00 in stainless, Juuk’s aluminum version is $138.00, and the JETech is $18.99.